Most of the time we meet our couples for the first time at their engagement session. Daniel & Ashleigh were no exception. It can sometimes be a little awkward to meet and start a session soon after but usually after about 15 minutes everyone is relaxed and having a great time. Right away I loved these two. They are both such genuine and fun people. They both kept telling us how awkward they are were, but honestly they were amazing and had us laughing throughout the session! 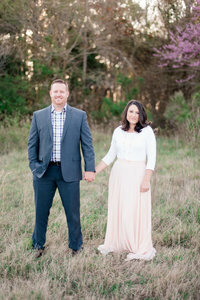 Their engagement session only got me more excited about their wedding that is going to be at the Norfolk Zoo!! It is going to be AMAZING!! And when in Ashleigh said there were going to be animals present at her reception she made my week! If I go missing during the reception… just look for me with the guest animals… That is where I will be. I asked Ashleigh to tell Daniel when she knew he was the one. It involved a day of sickness and sweet Daniel bringing her Taco Bell to cheer her up. ( Without asking if I might say!) She knew then that he had won her heart! Their session took place near our home. We literally walked from our house! Can I do all our sessions here? I seriously loved the convenience. Of course it is February so we were expecting cold weather when we planned it. However, much to our suprise it was close to 80 degrees! I cannot believe this weather! And then as we were finishing up a huge storm approached and hail the size of quarters came down! Again, this weather is insane! I am so glad we finished up in time so that none of us received any concussions! Ashleigh & Daniel, you two were so much fun! Luke & I cannot wait to celebrate with you in October at the Zoo! Here are some of our favorites from your session! Lets just pause here for a minute and admire this ladybug on her ring!!! What a fun shot this was… And a little too time consuming!